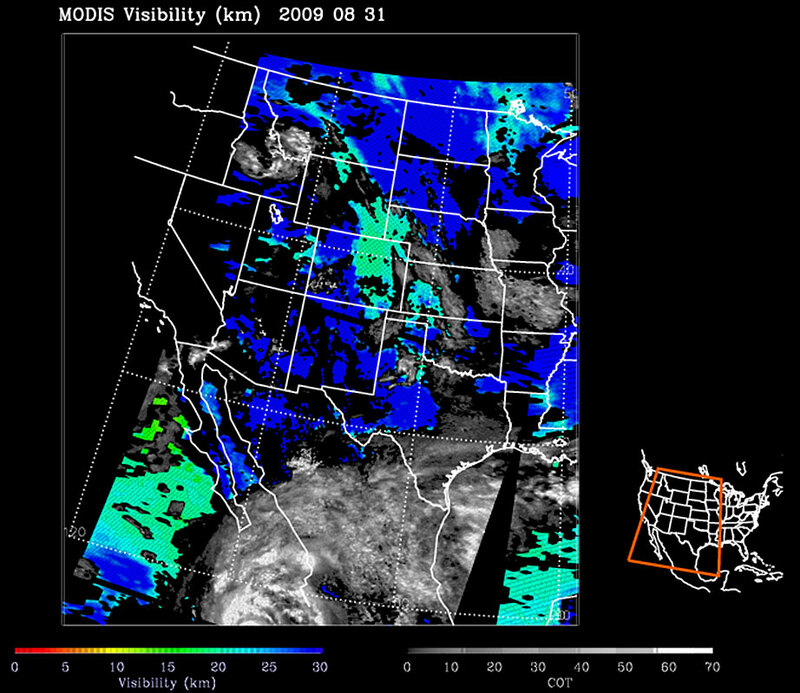 Example of visibility retrievals as generated by the ABI visibility algorithm using MODIS data (including MODIS aerosol optical depth measurements) over Denver on August 31, 2009, at 08:45 UTC. A broad area of reduced visibility (blue-green) is observed that extends throughout eastern Colorado, western Kansas, and western Nebraska northward into eastern parts of Wyoming and central Montana. The GOES-R visibility algorithm will leverage the enhanced aerosol detection capabilities of the ABI, together with the cloud optical depth product, low cloud/fog detection product, and GFS planetary boundary layer depth forecasts to retrieve an estimate of visibility. Visibility is an important weather variable to study as it has forecast implications for aviation, air quality, and public safety. Accurate information on visibility will aid forecasters in monitoring visibility on a much larger and finer scale, aiding in the accurate and timely forecasts for both the aviation community as well as the general public.